REMEMBERING 1991 in Moscow USSR | Happenings, Marketing and Technology Advice and Thoughts! 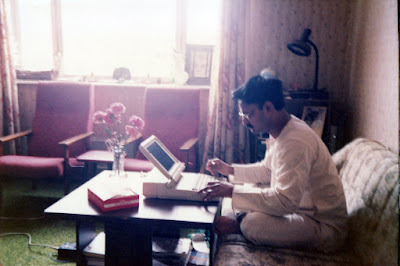 Twenty years ago I was living in the USSR and was on a trip back home to India when my friend Deviah M A showed me a "teletype" with the breaking news of a coup in Moscow. By the time I landed back in Moscow a new beginning was taking place. I lived in the same place vut became a resident of the Republic of Russia. This was indeed a new beginning. Many of us expats stuck together and new media began to open up. I watched CNN all day on my days off as it was the only English language TV station. I was on Radio Maximum - Moscow in the Morning - Chef's Corner with +Cami McCormick (Now a heroic reporter with CBS Radio) Another Moscow buddy +Dan Roam became a award winning author. +Karen Johnson profiled me in the Moscow Magazine http://b.shashi.co/qaOWYP It was not all rosy- Crime increased (my house was burgled and +Joanne levine covered it for Moscow News ) food became expensive, the rouble got devalued. I learnt lessons in economy that no university could have taught me. I became familiar with Prof. Jeffery Sachs and his advice to the Russian Government. In the late 90's I moved to the US and just came back from a vacation in India. THe economy engine in India is running in full steam, friends and relatives are thinking nothing of spending $40 on shirts and over $250k on homes. I see a lot of young employees who are cheerful and happy having achieved the middle class prosperity dream. After 20 years having watched economy changed in a different part of the world I wonder what is in store for us in the US. Dr. Jeffery Sachs - Do you have any answers?